Ole Bornemann Bull (Norwegian pronunciation: ) (5 February 1810 – 17 August 1880) was a Norwegian violinist and composer. Bull was born in Edvard Hagerup Bull, Norwegian judge and politician. His father wished for him to become a minister, but he desired a musical career. At the age of four or five, he could play all of the songs he had heard his mother play on the violin. At age nine, he played first violin in the orchestra of Bergen's theatre and was a soloist with the Bergen Philharmonic Orchestra. At eighteen, he was sent to the University of Christiania, but failed his examinations. He joined the Musical Lyceum, a musical society, and after its director Waldemar Thrane took ill, Bull became the director of Musical Lyceum and the Theater Orchestra in 1828. He also became friends with Henrik Wergeland, who later wrote a biography of Bull. After living for a while in Germany, where he pretended to study law, he went to Paris but fared badly for a year or two. 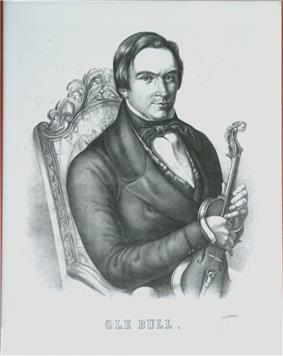 In 1832 in Paris he shared rooms with the Moravian violin virtuoso Heinrich Wilhelm Ernst. He was eventually successful in becoming a high-level virtuoso, giving thousands of concerts. In England alone these included 274 in 1837, during which visit he also travelled to some of the more remote parts of Britain. Bull became very famous and made a huge fortune. He is believed to have composed more than 70 works, but only about 10 are known today. Best known is Sæterjentens søndag (The dairymaid's Sunday). He also was a clever luthier, after studies in Paris with Vuillaume. He collected many beautiful violins and violas of Amati, Gasparo da Salò, Guarneri, Stradivari and others. He was the owner of one of the finest violins of the world, made by Gasparo da Salò about 1574 for Ferdinand II, Archduke of Austria. He played a Guarneri del Gesù. The violin, a gift of his widow to Bull's birthplace, is now in the Bergen Vestlandske Kustindustrimuseum. A commercial signature line of Ole Bull violins was manufactured in Germany. Bull was caught up in a rising tide of Norwegian romantic nationalism, and acclaimed the idea of Norway as a sovereign state, separate from Sweden—which became a reality in 1905. In 1850, he co-founded the first theater in which actors spoke Norwegian rather than Danish, namely Det Norske Theater in Bergen—which later became Den Nationale Scene. 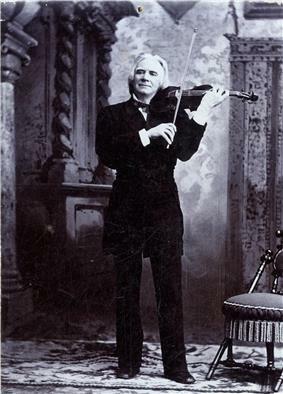 In the summer of 1858, Bull met the 15-year-old Edvard Grieg. Bull was a friend of the Grieg family, since Ole Bull's brother was married to the sister of Grieg's mother. Bull noticed Edvard's talent and persuaded his parents to send him to further develop his talents at the Leipzig Conservatory. Robert Schumann once wrote that Bull was among "the greatest of all," and that he was on a level with Niccolò Paganini for the speed and clarity of his playing. Bull was also a friend of Franz Liszt and played with him on several occasions. Bull called the highest point in Valhalla, Nordjenskald, which became the location of his unfinished castle. He soon gave up on this venture, as there was scarcely any land to till, and went back to giving concerts. Today the site is the location of the Ole Bull State Park, 132-acre (53 ha) state park in Stewardson Township, Potter County, Pennsylvania. Norwegian citizens paid for the construction of a monument on site to honor Ole Bull. The statue was placed in the park on the 150th anniversary of New Norway in 2002. In 1868 Bull met Sara Chapman Thorp (1850–1911), the daughter of a prosperous lumber merchant from Eau Claire, Wisconsin. On a return visit in 1870 (and despite their age difference; he was 60, she was 20), Bull began a courtship, and the couple was secretly married in Norway in June 1870, with a formal wedding in Madison later that year. They had one daughter, Olea (1871–1913). 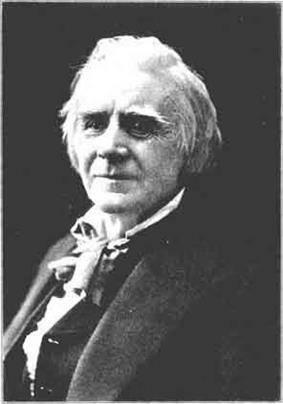 In 1871, he bought a summer home on a rise in West Lebanon, Maine which he named Ironwell.Sara traveled with Bull for the remainder of his career, sometimes accompanying him on the piano. In 1883 she published a memoir of Bull's life. Ole Bull's villa on the island of Lysøen was donated to the Association of Norwegian Ancient Monuments Conservation. Museet Lysøen consists of violinist Ole Bull's Villa, an old farm from the 17th century. Oleana in Potter County is situated in the mountains of northern Pennsylvania at the intersection of Routes 44 and 144 (Ole Bull Road). 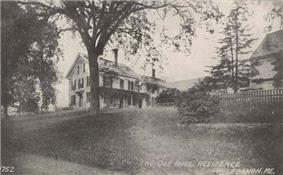 Ole Bull State Park in the Susquehannock State Forest is on the original site chosen for Bull's colony. The unfinished Ole Bull Castle is maintained by the park and can be visited by hikers. 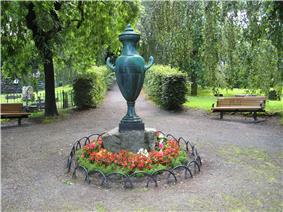 A monument to honor Ole Bull was placed in the park on the 150th anniversary of New Norway in 2002. Mammoth Cave in Kentucky has a room called Ole Bull's Concert Hall where he once gave performances. Loring Park in Minneapolis, Minnesota is the site of a bronze statue memorializing Ole Bull. Ole Bull Cottage, originally purchased to be a school for music by Ole Bull and his wife, is at Green Acre Bahá'í School in Eliot, Maine. Erected in 1896, the Ole Bull Cottage currently serves as the school library building. Ole Bull Academy (Ole Bull Akademiet) in Voss, Norway is a music education institution founded in 1977. Ole Bull Scene is a stage for cabaret, music and theater at the Ole Bull Plass in Bergen, Norway. Ole Bull - Gasparo da Salò violin, a wonderful decorated masterpiece of the famous Italian maker that the virtuoso used for 40 years of world tournee. Now is in the Vestlandske Kustindustrimuseum in Bergen. In 2006, director Aslak Aarhus released a motion picture titled Ole Bull—The Titan, the story of Bull's exploits and the impact it had on his French wife and children, who remained neglected in Bergen. In 2010 the Norwegian record label 2L released world premiere recordings of Ole Bull's violin concertos and his Spanish fantasy La Verbena de San Juan and a previously unknown version for violin and strings of A Sæterbesøg. The performers on the disc are Annar Follesø, violin, and the Norwegian Radio Orchestra conducted by Ole Kristian Ruud. ^ 'Ole Bull'' (Store norske leksikon)"'". Snl.no. 2013-02-27. Retrieved 2013-04-07. ^ 'Ole Bull / utdypning'' (Store norske leksikon)"'". Snl.no. Retrieved 2013-04-07. ^ 'Ole Bull'' (Classical Composers Database)"'". Classical-composers.org. Retrieved 2013-04-07. ^ 'Oles magiske fiolin'' (Bergen Vestlandske Kustindustrimuseum)"'". Kunstmuseene.no. Retrieved 2013-04-07. ^ Brekke, Nils Georg, ed. (1993). Kulturhistorisk vegbok Hordaland (in Norwegian). Bergen: Hordaland Fylkeskommune. p. 240. ^ 'The Ole Bull Colony in Potter County, 1852'' (Potter County Historical Society, 1952; Ole Bull State Park signage, 2010)"'". Genealogytrails.com. Retrieved 2013-04-07. ^ 'Biography of Ole Bull''(Pennsylvania Historical & Museum Commission)"'". Portal.state.pa.us. Retrieved 2013-04-07. ^ "Ole Bull's Colony Historical Marker". Explore PA History. Retrieved October 10, 2015. ^ "A Bull's Life — Ole Bull 200-års jubileum". Olebull2010.no. Retrieved 2013-04-07. ^ "Folio, A Journal of Music, Art and Literature," edited by Dexter Smith; Boston, April 1871. Books.google.com. Retrieved 2013-04-07. ^ Ola Storsletten. "Conrad Fredrik von der Lippe". Store norske leksikon. Retrieved October 10, 2015. 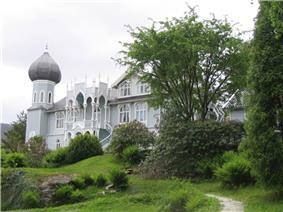 ^ 'Museet Lysøen'' (Kunstmuseene i Bergen)"'". Lysoen.no. Retrieved 2013-04-07. ^ 'Remembering Ole Bull’s dream'' (Royal Norwegian Embassy in Washington)"'". Norway.org. 2002-09-02. Retrieved 2013-04-07. ^ 'Ole Bull Cottage'' (An Intro to the History of the Green Acre Baha'i School in Eliot, Maine)"'". Bahai-library.com. Retrieved 2013-04-07. ^ 'Ole Bull Akademiet'' (Store norske leksikon)"'". Snl.no. 2013-02-27. Retrieved 2013-04-07. ^ "Ole Bull Scene". Olebullscene.no. 2012-10-16. Retrieved 2013-04-07.